There’s nothing like a heatwave to bring out the vegetable in you. Who wants to rush around like a carnivore in the middle of summer? It’s time for chilling out with the natural products of the land: fresh salads, roots and legumes. What could be nicer on a hot day? I’m pleased to see that David Kennedy, whose relationship with Ken Holland, master vegetable grower of Vallum Farm, gets ever closer, now offers a three-course vegetarian menu for £15 every Wednesday evening. He picks the vegetables fresh and creates a menu to suit. At the other end of the scale, the ten-course tasting menu at Jesmond Dene House that I raved about a few weeks back, is complemented by a £75-a-head gourmet veg-fest, with dishes like beetroot consommé and pecorino mille-feuille. 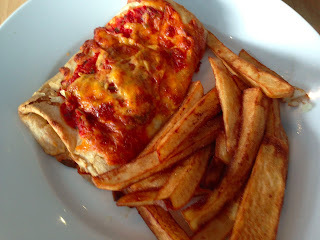 You don’t have to be a vegetarian to enjoy vegetarian dishes, provided the chef really knows how to cook. That’s the problem with many veggie joints: they’re often run for students by ex-hippies, specialising in stir-fry on a theme of Thailand, or dry veggie burgers and falafel balls. It’s all quite inedible for anyone not wearing ripped jeans or a kaftan. And, because vegetarians are grateful for any old bit of aubergine they can get in a world full of blood and pies, it’s not often that vegetarian cooking is fit for the mainstream. 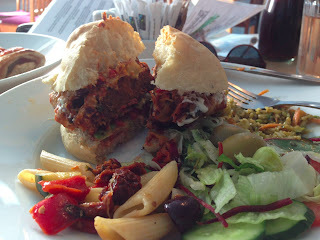 Outside London, the best vegetarian restaurants tend to be in cities frequented by students. Edinburgh has half a dozen, including the renowned David Bann and Henderson’s. But despite having around 40,000 students, Newcastle is virtually a veg-free zone, with only two eateries, one of which, Jack Sprats Café, appears to be in danger of closing. The other is a miniscule place in Heaton with 12 tables and sky blue walls. It’s called Sky Apple Café. If you think this name is a throwback to an age of psychedelic rock, you’d be right. It was founded over ten years ago by the couple behind a band called Blue Apple Boy. They split up and later sold the restaurant to their chef, Andy Young. And now I can let you into a little secret: Andy really knows how to cook. He earned his spurs running Blah Blah Blah, a well-known veggie haunt in South West London. However, I suspect that Andy Young’s spiritual home is California. His cuisine is pure Venice Beach: bohemian sunshine food. Which, given this heatwave, makes it perfect for a summery lunch. 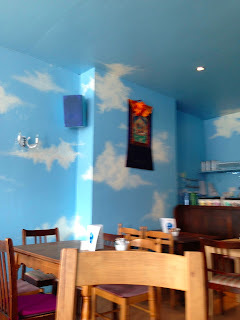 Mrs Diner and I were the only inhabitants of the blue-and-cloud-painted room, apart from a solitary god sitting in a Tibetan thangka painting. Andy is a buddhist, as well as being a terrific cook. Mrs Diner started with Halloumi goujons. 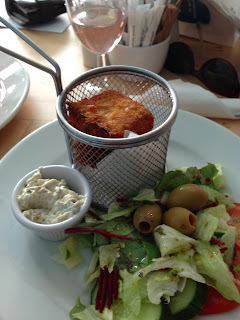 Served in a little wire basket, they looked just like fish goujons, with excellent homemade tartare sauce. Inside, that bland old staple halloumi cheese was transformed with ultrathin slices of aubergine and pesto. 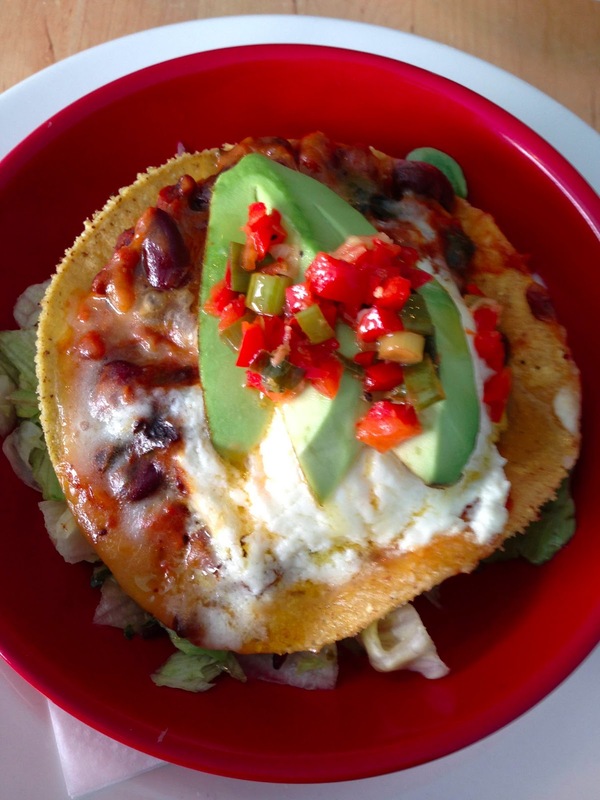 They were outstanding, and so too was my goats cheese taco, with refried kidney and butter beans, a nice salsa of lime and pepper, and slices of rather underdone avocado. Mrs Diner bravely ordered a “Tex Mex burger”. We held our breath and sipped house wine in anticipation of a Linda McCartney rubber special. Instead, out came a generous, juicy monster. Made with vegetables, beans, and probably a dollop or two of TVP (textured vegetable protein, made from soy, is the basis of most veggie fake meat), it was far better balanced and lighter than the beef burgers in most gourmet joints. With Monterey Jack cheese, salsa, sour cream and rings of hot red jalapeño, it was delicious, though the salads it arrived with were disappointing: curried rice and penne were dull and distracting. We did share some good double-fried chips. 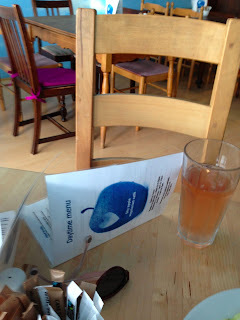 These came with my burrito, which was stuffed with hummus, salsa and roasted aubergine and courgettes. You get the feeling that Andy Young, who has a degree in chemistry, is passionate about the science of combining flavours and textures. As a result, his cooking exudes confidence. For dessert, I chose saffron and rhubarb tart. The custard had as much saffron as a Buddhist monk’s robe, and the fruit was perfect. The bill for 2 came to just £30, with two glasses of house wine. In the evening, the aubergines and courgettes get polished up for a grander menu, so booking is advised. Heatwave or not, I’ll be back. Brings out the vegetable?? Maybe the vegetarian ... You seem very fond of David Kennedy, he's a regular feature in your posts. No, Nicky, vegetable = person rendered motionless (in this case by the heat). I like David Kennedy because he cares about his ingredients - and he's also a very good cook. Ahhh, I understand what you mean now. Always good to see people who care about their ingredients, but I wondered why you tend to focus on one person. I guess I see many similar equally passionate people in our area who are passed over for David. He's good, I agree, but he's getting all the press. It would be nice to see a balance. I don't think I've exactly focused on David Kennedy, just reviewed two of his three restaurants, one of which only got 3 stars!